(Istanbul) – Turkey should allow Syrians at its border fleeing the fighting in and around Aleppo to seek protection in Turkey, Human Rights Watch said today. Forcing people to remain in a war zone, where they risk death and injury, is no solution to the challenge of protecting Syrians fleeing their country. European Union governments should match their calls on Turkey to let Syrians enter the country with increased resettlement of Syrians from Turkey to the EU. Turkey hosts at least 2.5 million Syrian refugees, more than any other country and the largest number of refugees in any single country worldwide. In late January 2016, Syrian government forces, backed by Russian airstrikes, began an offensive in northern Syria to break the siege imposed by armed opposition groups on the towns of Nubbul and Zahraa and to cut off the city of Aleppo from Turkey. Human Rights Watch has documented unlawful air strikes in the offensive, including the use of inherently indiscriminate cluster munitions. According to the United Nations, between February 1 and 9, about 45,000 people fled the offensive and travelled to nearby border areas with Turkey, adding to the estimated 6.5 million Syrians already internally displaced in Syria. On February 9, Turkey’s Foreign Minister Mevlüt Çavuşoğlu claimed that during a recent unspecified period, Turkey had allowed 10,000 Syrians to cross in a “controlled fashion.” The UN refugee agency in Turkey has not confirmed Turkey’s assertion. Instead, aid agency staff told Human Rights Watch that while a few people with serious injuries have been allowed to cross to Turkey for medical treatment, thousands have been refused entry at the Öncüpınar/Bab al-Salama border crossing, remaining near the border in poor conditions. The rest have fled to the nearby towns of Azaz and Afrin or to eight old camps for internally displaced people to the east of Azaz along the Turkish border. Aid workers say the camps sheltered 40,000 displaced Syrians before the recent crisis and are now filled beyond capacity, with about 50,000 people. Turkey’s generosity in sheltering 2.5 million refugees shouldn’t stop now and leave thousands of Syrians stranded at the edge of a war zone, Governments in Turkey and the EU should keep all borders open to Syrians and others in need of protection. Syrian activists told Human Rights Watch that Syrians stuck at the border and living in nearby villages such as Azaz are sleeping in the streets, fields, and in schools. 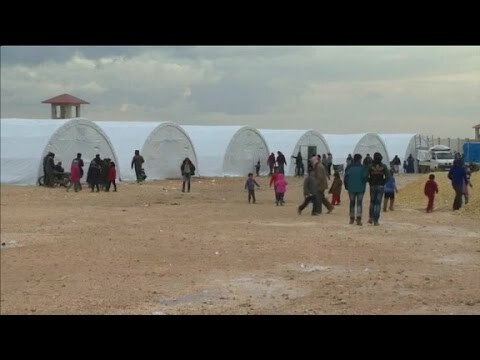 A number of aid workers in Turkey have reported that the Turkish authorities have allowed international aid groups based in Turkey to cross into Syria and join Syrian aid groups to distribute tents and other assistance to Syrians stuck at the border crossing and in nearby border areas. Human Rights Watch said that allowing much-needed cross-border aid does not absolve Turkey of its obligation to respect the principle of non-refoulement. That principle, under customary international law and international human rights law, prohibits rejecting asylum seekers at borders when that would expose them to the threat of persecution and torture. While Turkey’s desire to limit the number of refugees may be understandable, the current situation in northern Syria makes clear that any “safe zone” would be safe in name only and would put the lives of displaced people in danger, Human Rights Watch said. Since early 2015, Turkey has all but closed its borders to Syrians fleeing the conflict, who have increasingly been forced to use smugglers to reach Turkey. In late 2015, Human Rights Watch documented how Turkish border guards intercepted Syrians who crossed to Turkey using smugglers, in some cases beat them, and pushed them and dozens of others back into Syria or detained and then summarily expelled them. EU leaders, including the EU’s High Representative Federica Mogherini, have said that Turkey should allow Syrians fleeing Aleppo to reach safety. In November, the EU concluded a controversial migration deal with Ankara to curb migration flows to Europe, offering €3 billion in aid to assist Syrians in Turkey, reinvigorated EU membership negotiations, and visa-free travel for Turkish citizens. Some European leaders have also called for a plan under which Turkey would process all asylum seekers wanting to reach the EU, in exchange for a pledge by EU states to resettle a few hundred thousand refugees from Turkey to the EU over an unspecified period.